The following steps will explain how to secure applications in SAP Cloud Platform, CloudFoundry which are built based on the S/4HANA Cloud SDK. Setting up and configuring the App Router component as a central entry point to your microservice landscape to handle authentication and authorization for you. Protect your Java microservice so that it only accepts requests based on a valid JSON Web Token (JWT) that is received from the App Router. Assign roles and scopes to your application users and let your backend deal with authorization information. You did at least all steps until Step 3 with SAP S/4HANA Cloud SDK: HelloWorld on SCP CloudFoundry. To make the examples a bit more plastic, I created a completely new trial using a P-User with a throw-away e-mail address. Before we dive deeper into the real setup of the architecture, let’s quickly review the architecture we intend to go for. Figure 1 presents the final setup. First, we still have our existing “Hello World” or “Business Partner” Java-based microservice that we have created in the previous tutorials. However, instead of letting the customer access this application directly, we will use the so-called Application Router (App Router) that serves two purposes. On the one hand, the App Router is a general entry point into the world of microservices. The main idea is that you can split an application into multiple microservices with independent deployability, polyglot runtimes & persistence and independent teams. Therefore, a central entry component is required that hides the complexity of the microservice landscape from the end customer. On the other hand, the App Router is mainly responsible for managing authentication flows. The App Router takes incoming, unauthenticated requests from users and initiates an OAuth2 flow with the Extended Services for User Account and Authentication (XSUAA). 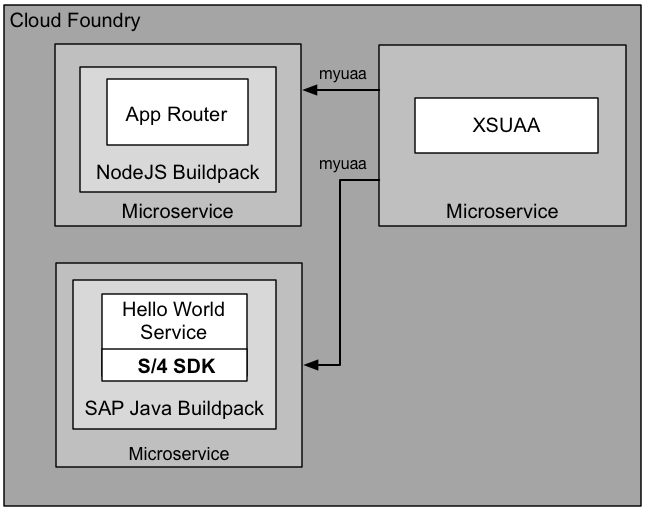 The XSUAA service is an SAP-specific extension of CloudFoundry’s UAA service to deal with authentication and authorization (it may again delegate this aspect to other providers such as external Identity Providers, see later in this tutorial). If the user authenticates at the XSUAA, it will respond with a JSON Web Token (JWT) containing the authenticated users as well as all scopes that he or she has been granted. The JWT is passed by the App Router to the underlying microservices so that they are freed up from this task. At the same time, these microservices can only be accessed with a valid JWT, hence, are protected from unauthenticated traffic. The JWT contains a signature that needs to be verifiable by every microservice to establish trust. Hence, every service require a key (client-secrets or public keys) to verify this signature and reject any requests with non-valid JWTs. Therefore, every service has to maintain a service binding to the XSUAA that provides this information for runtime verification (Figure 2). To enable this, every microservice binds to a dedicated XSUAA instance which writes this information into the VCAP_SERVICES environment variable which the microservices can use to verify any token’s validity. With these basics in mind, let’s create the picture of Figure 1 and Figure 2 by setting up the App Router, XSUAA and backend microservices to enable full application security. Setup the App Router to authenticate your users. This alternative approach requires that you have npm installed on your machine. Within <destLocation> create a new manifest.yml file for the AppRouter microservice with the following content. Adapt the TENANT_HOST_PATTERN in the manifest.yml file to the host of the Cloud Foundry region you are running on; the above assumes EU (eu10). The TENANT_HOST_PATTERN is a variable that declares the pattern how multiple tenants in the URL are identified and handled. During runtime, the App Router will match the incoming host against the pattern and tries to extract the regular expression from the pattern. It will use the matched string to delegate authentication to the respective XSUAA tenant (in SAP Cloud Platform the tenant ID corresponds to the subaccount ID. If you desire different URL patterns, you need to change this pattern accordingly. Note that the TENANT_HOST_PATTERN variable is only required in real multi-tenant application, i.e, applications where a physical deployment serves multiple clients from the same deployment. We assume in this blog series that we want to build multi-tenant applications, as we aim towards cloud-native development. However, this variable is not necessary if you have a single-tenant application. To realize this, the xs-security.json security descriptor may declare tenant-mode: dedicated (see step 5 below). Destinations is a variable that declares the internal routes from the App Router to the underlying backend microservices. As we only have one hello world microservice yet, we define only one destination called app-destination here. This app-destination is referenced by the previously created xs-app.json file. Now we need to create a service binding to the XSUAA service. As a prerequisite we require a xs-security.json (security descriptor) file that contains a declaration about authorization scopes we intend to use in our application. In our case, we simply declare a DISPLAY scope that we will use later on to authorize our users. In addition, we declare a so-called role template called “Viewer” that references our DISPLAY scope. We put this file to <destLocation>/xs-security.json. For a more detailed explanation on scopes and role templates, see the appendix of this tutorial. More details on the syntax of the xs-security.json can be found here.Note 1: that the xsappname has to be unique within the entire XSUAA instance. We follow here the same pattern using our <appID>-<tenantID>. In my case this is firstapp-p1942765239trial.Note 2: As explained above, tenant-mode: shared assumes a multi-tenant application and will require the TENANT_HOST_PATTERN variable to be declared. You may also use “tenant-mode”: “dedicated” if you develop a single-tenant application. You may have different content in the approuter folder depending on the download alternative you have chosen. Ensure that xs-app.json and package.json and the node_modules directory with content are present. After authentication works with the App Router, your java backend service is still fully visible in the web and not protected. We, therefore, need to protect our java microservices as well so that they accept requests with valid JWTs for the current user only. In addition, we will setup the microservice in a way that it deals with authorization, i.e., understands the OAuth scopes from the JWT that we have configured previously using the xs-security.json file. In the following, we will use the Spring Security framework to protect the microservices. You can also use standard mechanisms of the SAP Java buildpack to achieve the same. If you do not want to use Spring Security please follow the steps here, nonetheless, the concepts described hereinafter apply for both methods. At the time of writing the latest package is XS_JAVA_1-70001362.ZIP (19.03.2018). The org.springframework.security packages add certain aspects of the Spring security framework to our application, in particular the OAuth framework of Spring security. The com.sap.xs2.security packages contain specific security adaptations for the CloudFoundry/XSA environment. The com.sap.security.nw.sso.linuxx86_64.opt packages contain platform-specific native implementations for the JWT validation. Afterwards you need to go to your web.xml in src/main/webapp/WEB-INF and add the following lines. If you have used the Archetype in Step 3 of the Tutorial: https://blogs.sap.com/2017/05/19/step-3-with-sap-s4hana-cloud-sdk-helloworld-on-scp-cloudfoundry/ these lines should be already there and you can simply uncomment them. 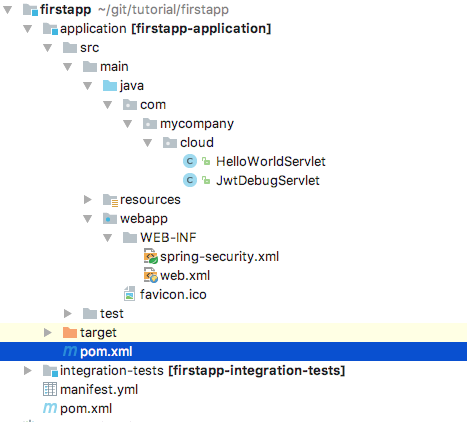 This configuration introduces the Spring Security Filter Chain on all incoming routes of your Java microservice and declares that the entire security configuration can be found in a file called spring-security.xml. In the next step we need to protect our routes on a more fine-grained basis by introducing the file spring-security.xml to our /src/main/webapp/WEB-INF directory. If you have used the Archetype in Step 3 of the Tutorial: https://blogs.sap.com/2017/05/19/step-3-with-sap-s4hana-cloud-sdk-helloworld-on-scp-cloudfoundry/ this file should be already there. Now that we saved the backend microservice from unauthenticated users, we also want to make sure that certain endpoints can be called only when users have specific authorizations. In the following example, we want to use our Display OAuth scope. Furthermore, the user accessing the application, needs to be assigned the Display OAuth scope. This is done using the SCP cockpit. Second, create a new role collection which you can give an arbitrary name. In our case, we call the role collection Business Partner Manager. Afterwards you have a route that is protected by the Display OAuth scope which you can still access because the user has now the corresponding role. That’s it for today. Now you have learned the basics to protect your application on SAP Cloud Platform, CloudFoundry based on the SAP S/4HANA Cloud SDK. Stay tuned for upcoming blog posts about more advanced usages of the SAP S/4HANA Cloud SDK. The following picture explains how the various concepts are related to each other. Gray Box: As a SCP developer (e.g., SAP, partner, customer) of the business application (gray box), you define role templates which may contain multiple OAuth scopes. The developer here define the scope, role templates and additional attributes within the xs-security.json as explained in this tutorial which is used when creating the service instantiation to the XSUAA. Orange Box: As an SCP tenant administrator of the business application (customer) can create a role collection which is spanning multiple roles reflecting the role templates. This way you can achieve, on the one hand, a fine-granular authorization control for the microservices and, on the other hand, compose them very flexibly in coarse-grained role collections. The idea behind this is, that, for example, the Business Partner Manager role collection may span multiple applications and microservices all having individual scopes. The role collections resolves the roles and scopes and returns a union of all scopes which are composed by the role collection. Green Box: As an administrator of the users (customer), the role collection can then be assigned to the final user using the SAML attribute “Groups”. Sometimes it might be necessary to investigate the JWT on the backend microservice during development to check for potential errors. Here is an example Servlet that prints the token out. Afterwards you may use https://jwt.io/ to decode the token. Note: You should never use this with any productive JWT as these tokens are shared on a public website. Fallback to local solutions. So far, we have used the XSUAA service itself as the user provider. However, in production scenarios customer’s may want to use their own Identity Provider (IdP) as a user provider or delegate into on-premise user stores such as LDAP or ActiveDirectory. In the following, we quickly show how the XSUAA service can delegate requests to such an external IdPs. To make this happen, the IdP and the service provider (SP) have to exchange security metadata, i.e., the IdP has to import the metadata of the SP and vice versa. 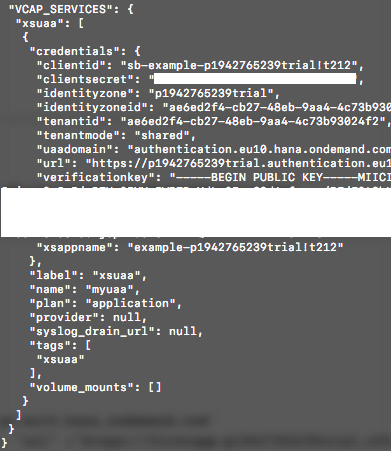 You can retrieve the metadata from your XSUAA tenant by following the pattern https://<tenantID>.authentication.eu10.hana.ondemand.com/saml/metadata. In my case, that would be https://p1942765239trial.authentication.eu10.hana.ondemand.com/saml/metadata. This downloads the metatdata to your local computer. Second, you need to import the metadata into your IdP. In the following, we use an own SAP Cloud Identity tenant to do this. Import the SP’s metadata and click “Save”. When adding this and recreating a service instance, it is not required to set the TENANT_HOST_PATTERN . thanks a lot for the feedback, very good points. I tried to incorporate them already during the text now! I also like the summary; it provides a good introduction to the fairly complex topic. Currently we only support the mapping from IdP User Groups (via SAML attribute “Groups” – the name is currently hard-coded) to Role Collections. The same IdP User Group can be used to assign one or more Role Collection to a user (on UAA side). thanks a lot for the feedback. The article now tries to highlight this distinction better. 06.10.2017: Changes XS2 security libs to LATEST version to avoid troubles with newer versions of these libs as they are not managed over Maven Central. 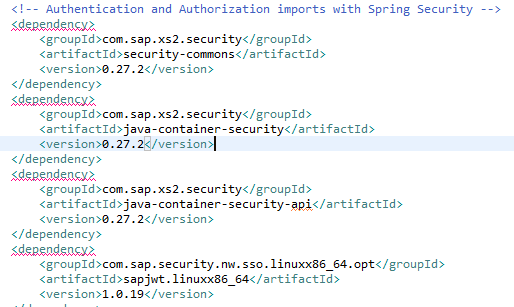 04.10.2019: Updated Java dependencies to latest XS2 security libs (0.28.6) and OAuth 2.3.3.RELEASE. It raises the following exception. Can you please help in resolving the same? this sounds like a very general issue with your cf command line client. Can you post what cf help brings up? Thanks for the response. Below is the result of cf help. I did not have this error before, but your cf config.json seems to be broken. Maybe reinstalling the CF CLI tools help. Is the exception address the only thing that appears on cf api? I tried a couple of solutions but none of those helped in solving this issue. Deleted config.json file and let CF generate that again. Reinstalled the CF CLI tool. This exception also occurring when I use the commands cf login. I followed your guide and tried to switch to our own IdP. When I launch my app it asks to login but it is not my IdP but the iot-security (https://iot-security.accounts.ondemand.com/) one. hard to say without having more details and not having any information on your SP. Have you really imported the metadata from whatever subaccount (provider, consumer) into your own IdP and also vice versa, i.e., your IdP has the metadata of your whatever XSUAA instance that is attached to your SP. If you have logged in before, you may also require to kill any existing session cookies using Chrome Dev Tools or similar. I could have a look, if you give me more details or even access to your account. This is one of the blog which has covered all the topics needed to enable and handle security. Thanks for such a great content. Really appreciate your effort. happy that the blog helped you and hope you enjoy working with SAP Cloud Platform and CloudFoundry. I’ve followed your blog with my SAP Cloud Foundry Trial Landscape account and all worked fine. Now I’ve created a new account on the Trial Landscape environment, it’s just a test account. Does this means that only “real” SAP accounts can follow your blog? Is there any easy way to fix it? I tried also with the P-Number, but I got the same results. thanks for your feedback. This error typically occurs, if you haven’t logged in with this specific user at your XSUAA instance before (e.g., on approuter). After logging in once, you should be able to edit assignments for your user. it seems that the link for downloading the “XS_JAVA” package now brings to an empty list. Could you please double check? I had to type “XS_JAVA” in the search box for downloading the package. Fixed. Thanks for the remark. seems like you have pushed only the package.json to CF and CF does not have a link to the SAP NPM registry. I would recommend set the config + npm install locally and then push the whole local content to CF. Maybe it works with an extra .npmrc file (https://github.com/npm/npm/issues/4145), but I have never tried this myself. Very good article. I only have one question. From the JWT Token I can get only the scope of the current logged on user. Is there a way to see also the roles behind that scope using xs2 security ? not to my knowledge, I also just but it is an interesting question. I will check this soon when I will touch this topic again. Also the XS2 libraries do not seem to have any methods for retrieving the roles from the JWT. Thanks Philipp. You post has helped me a lot in securing my XSA application which currently I have been working on recently. I faced the issue having access problem in through web router to the application, from your post I realized, I didn’t forward the Token currently through destination in the manifest.yml when I push the application. In terms of this URL cfapps.eu10.hana.ondemand.com you used in the destination as well as api setup. Currently, I can only use URL which is the machine host with expected port where I run this XSA application. I cannot modify this URL like something similar to cfapps.sap.hana.ondemand.com. Did I miss something here? Or if it’s still unclear, I would like to provide more information I have here. happy that the blog helped you to get your security setup fixed. Regarding the domain eu10.hana.ondemand.com, you cannot change that at the moment. This is a so-called shared-domain, i.e., an domain that exists across or independent your Cloud Foundry organization. If you try to create your own shared domain using cf create-shared-domain this will return with an error telling you that you are not allowed to create your own shared domain. You can create your own org-specific domains. However, they are not reachable externally. 2018-04-11T15:26:11.62-0400 [APP/PROC/WEB/0] ERR npm ERR! enoent and is related to npm not being able to find a file. this looks like the package.json is not deployed to CloudFoundry. Please show the content of your approuter directory and how you push the approuter to CF. I am unable to attached a image here, so writing the folder structure. I have following folders and files in approuter. I placed this approuter folder inside a directory(favorite location) along with manifest.yml and xs-security.json files. In command prompt, i changed the working directory to favorite location and executed the cf push command. Just to be complete here. This discussion is under investigation in https://stackoverflow.com/questions/49879999/after-deploying-the-approuter-to-cloud-foundry-the-app-is-getting-crashed. We are not using Java spring framework. We have tried steps given in “Configure Integrated Container Authentication of the SAP Java Buildpack”. But still our app is not protected. Anything we are missing? using the Spring security artifacts should be independent of whether you are using the rest of the Spring framework or not. Our tutorial series is based on TomEE, hence, the blog is also compatible with non-Spring containers. However, if you need help regarding servlet protection with the standard servlet approach, I need more information on what you did already. Btw: The standard servlet approach is also described in our book which will be available at the end of the week: https://www.sap-press.com/extending-sap-s4hana_4655/ . When I try securing the backend service using spring (Protect your backend microservice). Could you please check that you included all the dependencies as shown above. We are developing the approuter solution in one of our application in SAP Cloud Foundry. 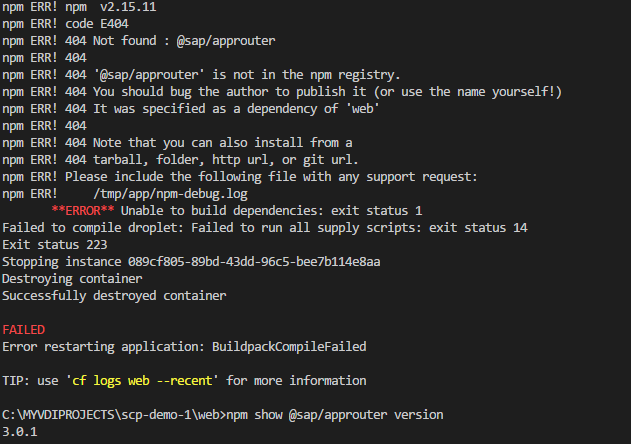 There we have successfully implemented the approuter with trust management in CF. 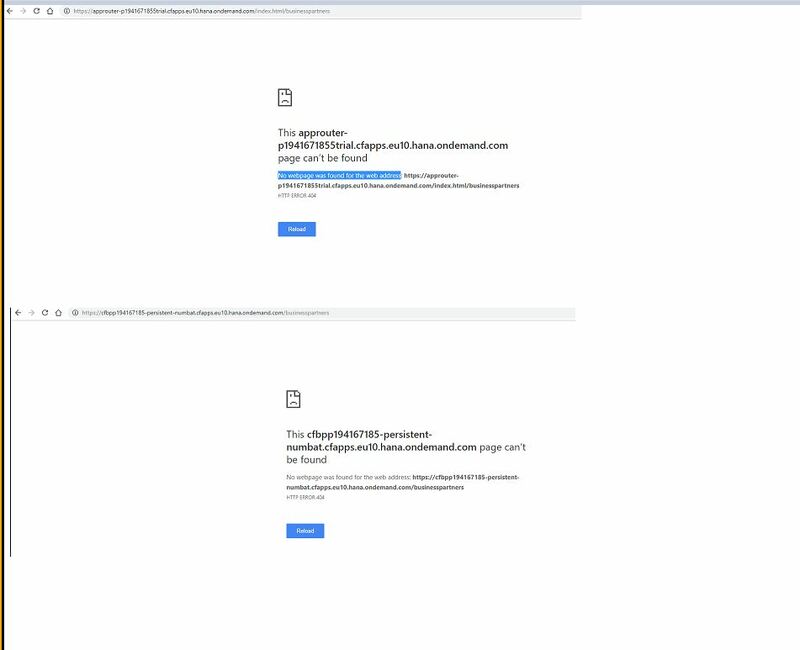 Now through approuter endpoint URL we are able to navigate to the third party SSO/IdP provider login page and thereafter we are getting the specific user ID back in the approuter (login-provider.js) when SSO has been authenticated against the credentials and back to approuter. Now we need to carry forward the same user ID in our actual UI application which we have developed in SAP UI5 for session management and other backend service call (build on nodejs). It would be a great help, if you can show us some path to do the same. thank you for your question! Have you verified whether your XSUAA instance returns a JWT in the HTTP header? If so, you should be able to read the user ID from there. I hope this helps you! If not, don’t hesitate to ask further questions. I’m getting the JWT token in login-provider.js in approuter and getting the userid there. 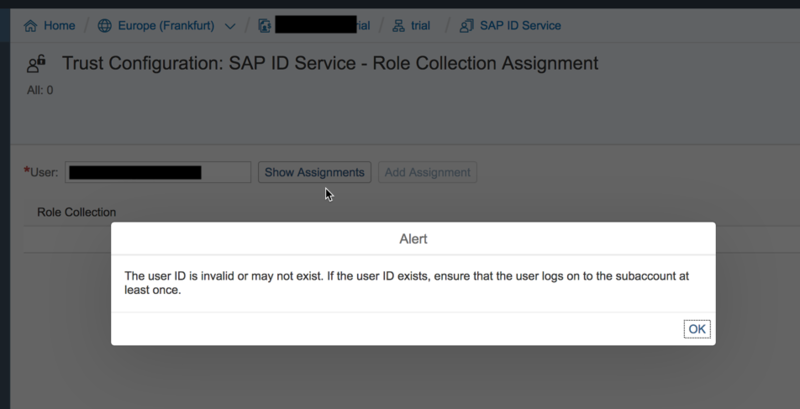 Now struggling to carry forward the userid to the destination application (SAP UI5). Could you please help to to find the path forward that how I can get the same userid in SAP UI5 application. This will be a great help! Thank you. as far as I am aware, when redirecting incoming request (based on the “routes” in the xs-app.json), the approuter should by default forward the JWT to the respective destination. Are you using the approuter as-is or have you done any modifications to it? thanks for this great blog and also to everyone contributing to the series. Question – My understanding is that this blog covers the OAuth SAML bearer flow. Now let’s assume I want to access the API via POSTMAN using OAuth. How would I go about doing it? thank you for your question! I’ve never tried setting this up before, so I cannot give you a definitive answer. However, quick research suggests that Postman seems to support an OAuth setup. Therefore, with a little research, you should be able to set it up. Let me know if this helps you and don’t hesitate to come back to us with further questions! Thanks. I’ve done some reading and would like to share what I’ve learned. Maybe someone else might find it useful. I am trying to add this security to my spring-securtiy.xml file. and then when I try to test it via postman by requesting token, it gives me the error of access denied. but if I remove authority code, everything works fine from the postman. thank you for your question! It seems that a new version of the sap-java-buildpack requires a newer version of the spring-core dependency. If you update the version of spring-core from 4.3.0.RELEASE (as described in the blog post) to 5.0.8.RELEASE you should not get any NoClassDefFoundErrors any more. If this doesn’t solve your issue don’t hesitate to get back to us! Edit: I found out that removing the spring-core dependency also works with the latest sdk version, as our SDK bom provided the spring-core dependency in version 5.0.8 out of the box. yes, the issue is resolved after I specify the spring-core to a new release, thanks Chris. Thanks a lot for your great article! It helps a lot with my current project on cloudfoundry. I have one question to take it one step further though. In step 9, we are redirected to the page to login with email and credential. Is there a way for an SAP employee who has the certificate for SSO in the client end to be logged in automatically? thank you for your question! Unfortunately, we have not yet looked into this possibility, so I cannot give you a definitive answer here. Generally, it seems to be possible to configure SSO for your application, see here. However, in order for SAP certificates to be recognized, I’m guessing the respective identity provider would need to be able to validate them. Hope this helps you somewhat. Don’t hesitate to get back to us if you have further questions! Link “follow the steps here” in Protect your backend service is not working. group id “com.sap.xs2.security” not available in Maven repository. if any alternate dependencies, send to us. please download the libraries from Service Marketplace and install them into your local repository as written in the blog. Thank you, I am able to login with sample application. I am trying to secure my application with spring security. I have changed my backend manifest.yml to bind XSUAA and trust for all identity zones. After deployment my backend application and App router are giving the same error as below. This typically indicated an issue with dependencies in your project. Please provide detailed logs on Stackoverflow to investigate the issue further: https://stackoverflow.com/questions/tagged/s4sdk. Please note that I have updated dependencies to the latest and greatest today and tried it successfully out. In addition, I advise you to scan the existing question on Stackoverflow, as there were multiple issues into the same direction previously. You find the relevant documentation for the Cloud Foundry Environment of SAP Cloud Platformcan in the product page of the Authorization and Trust Management service. The service exists for Neo and Cloud Foundry. If application developers need to set up authorizations for business users, they find a guide that describes how to configure scopes and attributes in role templates (see Set Up Security Artifacts). Administrators perform the steps of assgning security admiins, establishing trust with identity providers, aggregating roles in role collections and assigning the role collections to users or user groups (see Administration: Managing Authentication and Authorization). The following link used to describe security without Spring is not working anymore. Please update. yes, the link unfortunately moved. You can now find it here: https://help.sap.com/viewer/65de2977205c403bbc107264b8eccf4b/Cloud/en-US/ead7ee64f96f4c42bacbf0ae23d4135b.html . I also fixed the URL in the document above. The approach is also described in the book “Extending SAP S/4HANA” in chapter 5 in more detail. I have gone through your tutorial. Everything is working fine in the local test run. But after deploying same application on Neo environment only HelloWorldServlet is working, when i try to run PurchaseOrderServlet I’m getting NOT FOUND error. Please help. the tutorial is about CloudFoundry and not Neo. Please use Step 8 of the S/4HANA Cloud SDK Tutorial to protect a Neo application. The architecture for doing this, is quite different. Thank You. I’ll follow the tutorial. Thanks for your great sharing. Now, my back-end service is already secured, and can be visited through app router. App router redirect the request to IDP( Identity Provider) for login, and then forward the JW token to back-end service. it works fine for the request coming front-end. but now, I get an issue on accessing the back-end service in batch model. I need to store the credential(username and password) of IDP in somewhere, then using the user name/password to access the back-end service. for example, is there any way like to visit the back-end service using ‘Post Man’ by passing the username and password which similar with batch access with username/password. I do not fully get your requirement. Do you want to access the backend directly? Again, you will never access the backend directly with the user information from the IdP but always via a JWT (OAuth Access Token). But Getting Forbidden in browser while sending POST requests. Please provide the solution for handling GET, POST, PUT, DELETE requests. I kindly ask you to provide your stacktrace and additional information via https://stackoverflow.com/questions/tagged/s4sdk or via https://answers.sap.com/tags/73555000100800000895. No luck Philipp, pls check my logs. seems like you have an issue with the CSRF protection. As written on your question please either provide a CSRF Token or disable the protection temporarily. The default behavior for any modifying operations is that a CSRF protection is required to avoid session riding attacks in productive cloud applications. Thank you Philipp, My issue solved with given approach. Above lines configured in my spring-security.xml. I am able to get http://localhost:5000/private/user page after approuter login. in general, this is a Spring security question and I recommend to check with the corresponding communities. From what I can tell high-level is, that interceptor precedence is based on the order in the XML file as written here: https://stackoverflow.com/questions/15998746/order-of-intercept-url-patterns-in-spring-security. (Mind the spring-security tag there for Stackoverflow). That is, more specific rules should come first. However, this is what you did. Philipp, Is there any approuter settings to ignore <approuter-url>/public/**** like urls from XSUAA login authentication? Hi Phillip. I am fairly new to CF and XSUAA and this post helped me a lot. Can you please explain how to get things like users full name (rather than only the email in the troubleshoot) and other information like role collection from SAP IDP through CF. Is there an endpoint on CF that hold this information? If not, can you please point me to where to find this info? I am currently developing a UI5 app and would require this info to tailor the experience of the user. Now you can configure in the roles section of your IdP (by default the IdP that Cloud Foundry provides, which you can access via the “Security” tab on the left) how these fields are populated. There you should be able to select “Identity Provider” for these fields. If this setups works, you should now be able to read these attributes from the JWT (which you can get via the AuthTokenAccessor). Hope that helps! Do not hesitate to get back to us with further questions! Hi Dennis! Thank you very much for your reply! We were able to import attributes to CF successfully. We are trying to get the info in a Spring controller class now, but we are unsure how to access AuthTokenAcessor and UserAcessor. We were unable to load Maven dependencies correctly, for com.sap.cloud.sdk.cloudplatform.security.AuthTokenAccessor or com.sap.cloud.sdk.cloudplatform.security.user.UserAccessor. Can you please point out what are the correct dependencies and imports needed for them? Alternatively, you can use scp-cf to get all the Cloud Foundry specific dependencies at once. Hi Dennis! Thank you so much, it worked, again! Though now it has been somewhat of a problem to get the attributes correctly set in CF. But nothing is showing up when I try to get any of these attributes. I expected the IdP to fill them up automatically after logging in and trying to fetch them. How can properly set them? Is the expected Value/SAML Value different? stupid question: have you made sure that the role your adding all the attributes to is also assigned to the user your testing this with? For me also getting empty values like below after assigning “role” to the tested user. Please suggest me what I missed? TL;DR: Mapping of SAML attributes does not work for the default IdP on Cloud Foundry. But I am unable to get uid: PXXXX, groups with your approach. To get the JWT as string and then use a JWT tool to parse it into a readable format to see which attributes you have access to. That’s unfortunate. I think that we are going to try SAP SSO instead . Provides a better experience and is more secure. I have deployed my application “extensibilityapp” in CF trial account and pushed Approuter also. But, while adding new Role, i couldn’t see my application id in Application Identifier list at all. Please help me to resolve this issue. 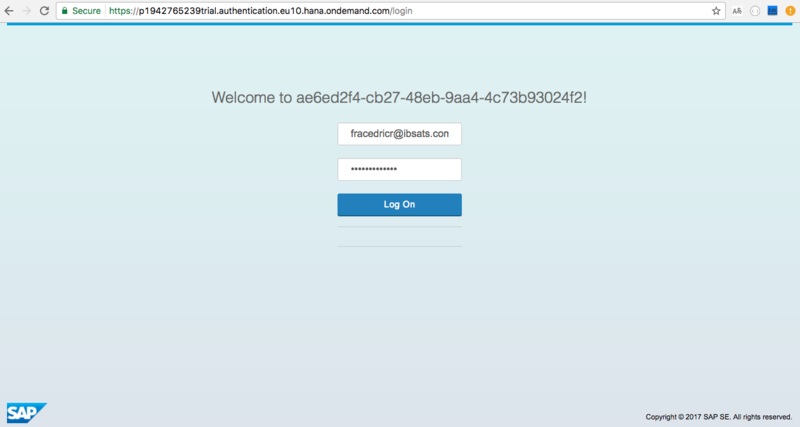 have you created an instance of the xsuaa and bound it to your applications and approuter as described in the blog. Deploying the artifacts only is not sufficient. Hi Philipp, thanks for the blog. I need some more info on the assignment of roles (to match the role template created by the app) and I’ve created a question on Stack Overflow. I would appreciate it if you could help me out. Thanks! I’ve managed to restrict access to my OData services by specifying a scope in the route in the xs-app.json file in the router. My question is, why do I also need to specify the scope in the spring-security.xml? If we follow the steps above then direct access to the back-end service isn’t possible, because there is no JWT. thanks for the question. I’ve provided some explanation to this on SO already, so kindly have a look there too in particular regarding your general auth problem from Neo to CF. 1. 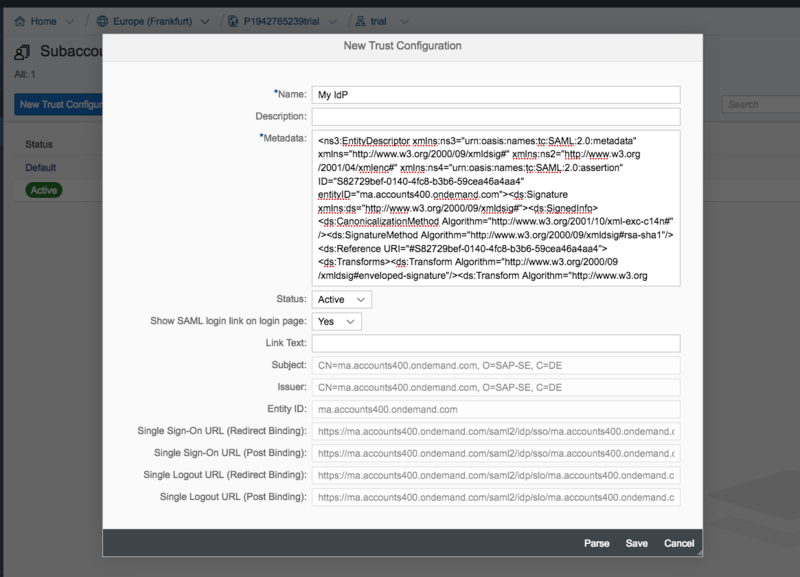 Handling authorizations in the AppRouter is really only a first line of defense and I do not recommend it. Remember your backend microservices are exposed to the web. If you just ask for authentication in the microservice you could theoretically call endpoints/routes which would require authorization checks (stealing the JWT, signing the JWT with arbitrary content etc.). This is unlikely, but possible. Thus, the microservice should protect against this too. 3. Overtime your microservice may change and so can your authorizations and their semantics. How will you make sure that you do not forget to update your approuter too? Yes you can mitigate this with good end-to-end tests, but I have seen multiple microservice architectures where authorizations are maintained in multiple places leading to chaos and leaked information because developers forgot to update authorizations in other places too. 4. Finally, changing authorizations in the AppRouter in production will lead to a forced logout of users. In particular, when you want to do continuous deployment I would rather keep the AppRouter as stable as possible and continuously deploy the microservices instead because they are stateless while the AppRouter is stateful holding the session information. In the end: It depends on your use case, but above are some productive observation that may happen when your application evolves. Thanks Philipp for sharing those insights. I made an update on SO. is it possible to define a destination to the approuter using BasicAuthentication? Checking the connection returns “401: Unauthorized”.. I want the approuter to forward the request with an valid jwt-token to my service. honestly, I have never tried this. The documentation tells that a route in the approuter can be protected with authenticationType: “basic” (https://help.sap.com/viewer/65de2977205c403bbc107264b8eccf4b/Cloud/en-US/c103fb414988447ead2023f768096dcc.html). Did you do this? Can you authenticate with the username and password at the approuter directly using basic authentication (e.g., from the browser)?